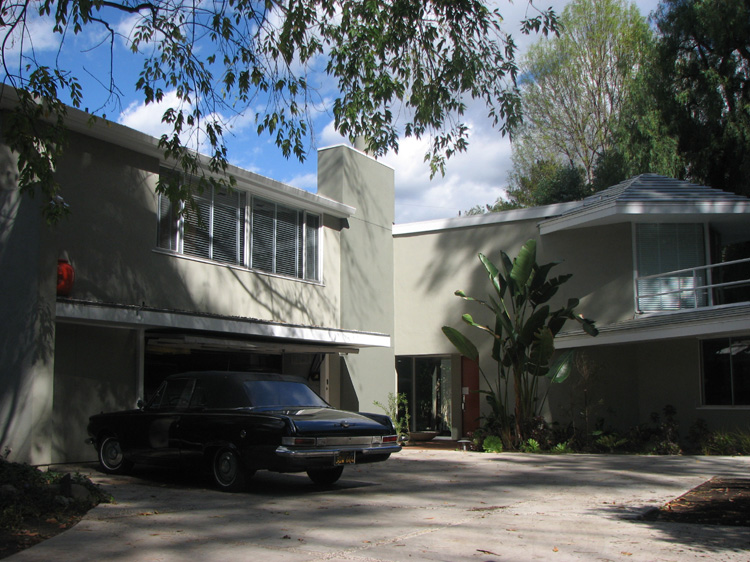 This house was designed by the Modernist architect, Gregory Ain (1908-1988) and was the Tarzana home of Leon S. Kaye and his wife, Claire, from its construction in 1963 until 1973 . This house was the last in the architect’s California career prior to his move to Pennsylvania to head the Penn State architectural school. It has been noted in many publications as a marvel of how Ain employed Frank Lloyd Wright’s Usonian principals in creating a design that not only creates a structure that is well blended with its surroundings, but is so as a two-story structure on a relatively flat lot. The house radiates from a focal point at the entrance with a central two story transverse wing toward either side of the entrance and two offset wings to the front and rear. The small hexagonal hipped roofs at the ends of the side and rear wings help to define the unique character of Ain’s design. Ain was a master architect who worked early in his career with architects Richard Neutra and R. M. Schindler. This design was a departure from much of Ain’s earlier work.